From 21 January 2019 EU citizens in the UK are able apply for the status that they will need after Britain leaves the EU, as part of the ‘public test phase’ of the EU Settlement Scheme that goes live in March 2019. The Home Office has invested considerably in the new system and most EU citizens should find it simple to use. But the sheer scale of the task – registering 3.5 million people – means even a low failure rate could leave thousands of people without status. 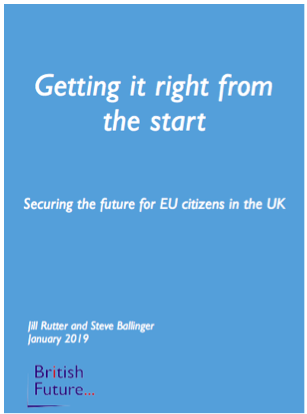 British Future’s report Getting it right from the start: Securing the future for EU citizens in the UK, sets out the potential barriers to people successfully securing ‘settled status’ or ‘pre-settled status’ . They include people not hearing about the scheme, not realising that it applies to them, struggling to provide evidence of residency or finding the system too hard to navigate. A ‘cost-price’ British Citizenship offer, at a reduced rate of £300, to EU citizens with five years’ continuous residency who meet the other citizenship requirements of good character, English language and knowledge of life in the UK. Administering the scheme, the report argues, is an important test for the Home Office. Get it right and the UK sends a strong message that EU citizens are welcome and the Government is in control. Get it wrong, however, and the consequences could be dire.